It Begins Monday: Giveaway Extravaganza Time! Yes, the time is once again almost upon us: The Annual DC Rainmaker Giveaway Extravaganza! While typically mid-summer, we’re going with late-summer for this edition (yes, it’s still summer for another couple of weeks…just barely). Next Monday (September 10th) starting at exactly 12:00AM US Eastern (0600 CET/CEST) the pinnacle of sports technology giveaway awesomeness will commence…again. Once again last year topped all previous years. Thousands of dollars in gadgets were given away to people everywhere on this little blue planet (everyone is welcome). 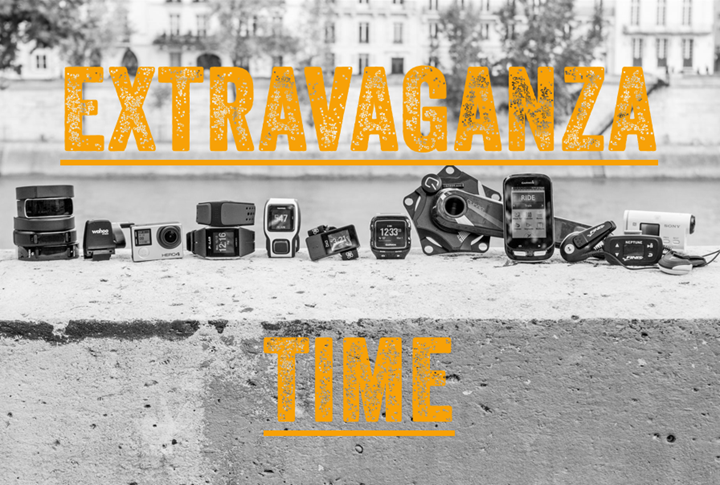 Here’s a summary post for all the craziness that went down last year: Trainers, GPS watches and bike computers, power meters, action cams, drones, you name it! There’s even a table with all the goods. I’m not sure we can make it any bigger than last year…but hey, we might as well try, right? Perhaps because the conversation with Clever Training pretty much always goes: How can we step it up again? Plus, like last year we’ve got two to three weeks worth of announcements that might follow as we go into both wearables season and Interbike. So, might as well also giveaway the unknown future too, right? Like the previous two years, I’ll be giving something new away every 2 hours. This means that every two hours a new giveaway starts and the previous one closes (i.e. 12:00AM, 2:00AM, etc…). The entry period will only be open for two hours for each giveaway, during which you need to leave a comment on that specific post. One comment = one giveaway. You can comment on each of the 12 giveaways throughout the day. So be sure to plan your entire existence on Monday around being able to enter during that two hour period for each giveaway. A) At 12AM US Eastern on Monday morning, visit dcrainmaker.com. B) Click on the giveaway post for that hour. C) Drop a comment on that post. D) Sit back and hope for the win! E) Repeat two hours later…for the rest of the day. F) Bask in the glory. So if you need to barricade yourself in the pain cave, bathroom, or other small facility for 24 hours to ensure proper attention to entry periods, that’s totally acceptable. This is the only day of the year a Snuggie is acceptable to wear. Just do what you need to do! If you aren’t sure how to convert your time zone to Eastern time, you can use this little tool to figure it out. Though, it doesn’t really matter as long as you know what time everything starts in your country. Cause yup…it’s gonna be awesome…again…as long as we don’t break the site. It happens. Note that the giveaways will be announced promptly on Twitter – so that may be easiest for those that are following along there! » Starting in 24 hours! The DCR Giveaway Extravaganza! Whoop whoop! I need a new pair of cycling socks! I would love it. Thanks Ray. Does anyone ever win this thing?